The other day I broke down and bought the Peterson Gulls of the Americas book (review to come later, probably). I've looked through the thing a ton of times since it arrived, and darn if I can't find either of the two gull species that appear in the above Mark Trail strip. I mean, let's think about it. It looks like the two birds on the left of the second cell (the detailed ones, not the faraway ones above the people) appear to be the same: white-headed gull, no black on the wingtips, unmarked bill. What could that be? 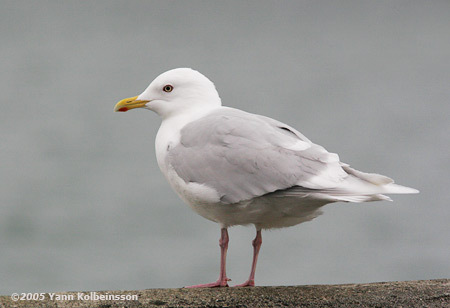 The lack of color on the wingtips could indicate an adult Iceland Gull or Glaucous Gull, but both of those species have bright red gonys spots. As for the rightmost gull, the one with the black head (or, as Peterson puts it, the "masked" bird), the combination of black head, black bill and unmarked wingtips leaves an adult Little Gull as the only possibility. So Mark Trail has apparently found himself on a pier with two aberrant-billed white-winged gulls and an unusually large Little Gull. Holy Moses, Mark! Alert someone! Ditch that boring chick and put something out to the listserv! If you want to protect natural resources for future generations, you better start with this magical, rare-gull attracting pier! 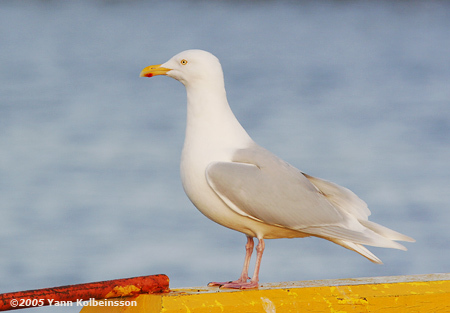 Much more probable is my assumption that Jack Elrod just drew generic gulls thinking that no one would notice. Well, guess what, I noticed. Mr. Elrod, I implore you, as this nation's preeminent naturalist/cartoonist you have a duty to present your drawings with the highest of accuracy! How are kids going to know to value our national resources when they're presented inaccurately? I mean, how hard is it to stick a little gonys spot on there?